Microsoft's browsers, Internet Explorer (IE) and Edge, continued to bleed users last month, according to the latest data from metrics company Net Applications. The multiple editions of IE and the two versions of Edge now available lost a combined 1.7 percentage points of user share in January, the largest one-month decline since October 2011. IE and Edge - Net Applications folds the latter's user share into an aggregate labeled "IE" - accounted for 46.9 per cent of all browsers used to reach the Web last month. A year ago, that number was 58.2 per cent. Meanwhile, Google's Chrome again gained significant user share, jumping to 35.1 per cent, a 2.7-point increase from December. Mozilla's Firefox slumped by seven-tenths of a percentage point to 11.4, the lowest since October 2015, hinting that another major downturn may have begun for the troubled browser. Apple's Safari was essentially flat at 4.6 per cent, showing that on OS X as well as Windows, browsers built by an OS maker are not guaranteed success. Computerworld has attributed the massive defections from IE to Microsoft's August 2014 announcement that users of older versions had to upgrade, in most cases, to IE11, by January 12, 2016. Since the announcement, IE has lost 11.6 percentage points of user share, which represents a 20 per cent decline. The addition of Edge -- Windows 10's default browser -- has not helped. While about 3.1 per cent of all users ran Edge in January, up from December's 2.8 per cent, Edge's share of all Windows 10 devices actually slipped from 28 per cent in December to 26 per cent in January, signaling that even the newest OS users have adopted non-Microsoft browsers in large numbers. By forcing customers to upgrade to a newer version of IE - or alternately, go with Edge - Microsoft opened the door to change. In this case, it had a disastrous impact on IE's user share as people, who were told they had to switch browsers in any case, used the opportunity to abandon Microsoft's and install rivals' - notably Chrome. If the 12-month trend continues, IE could be eclipsed by Chrome in Net Applications' user share estimate as soon as August. Using Net Applications' statistics and Microsoft's often-touted number of 1.5 billion Windows systems on the planet, Computerworld calculated that approximately 260 million Windows customers remain on an outdated edition of IE. 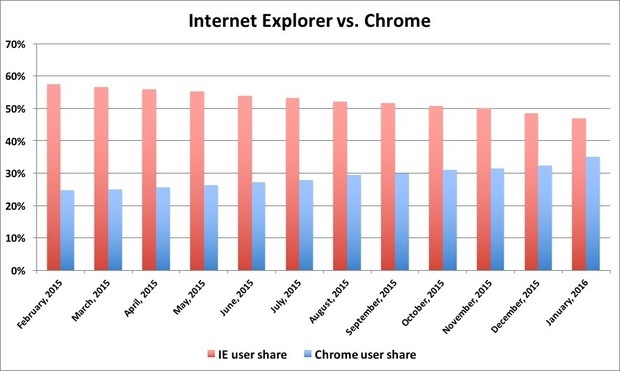 IE's and Edge's combined user share keeps shrinking, Chrome's keeps growing; the two could swap spots as early as August if the 12-month trend continues.